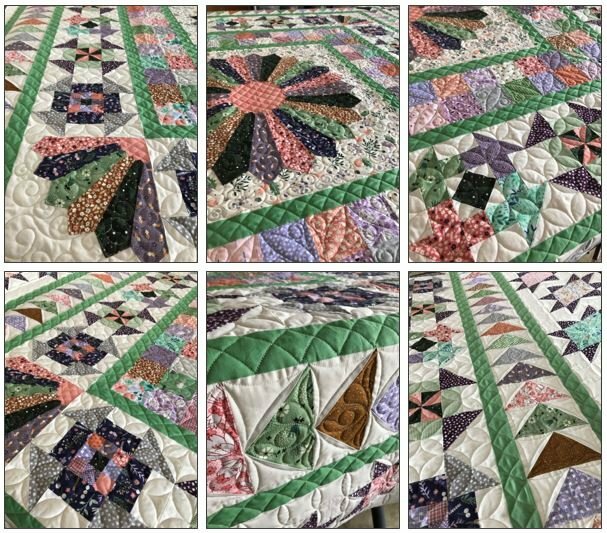 Forest Talk Medallion BOM Quilt! Programs - Most Include Backing! 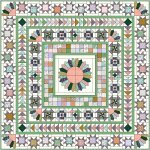 > Forest Talk Medallion BOM Quilt! Finished Size: 101" x 101"
NOTE: The background color is Marshmallow. 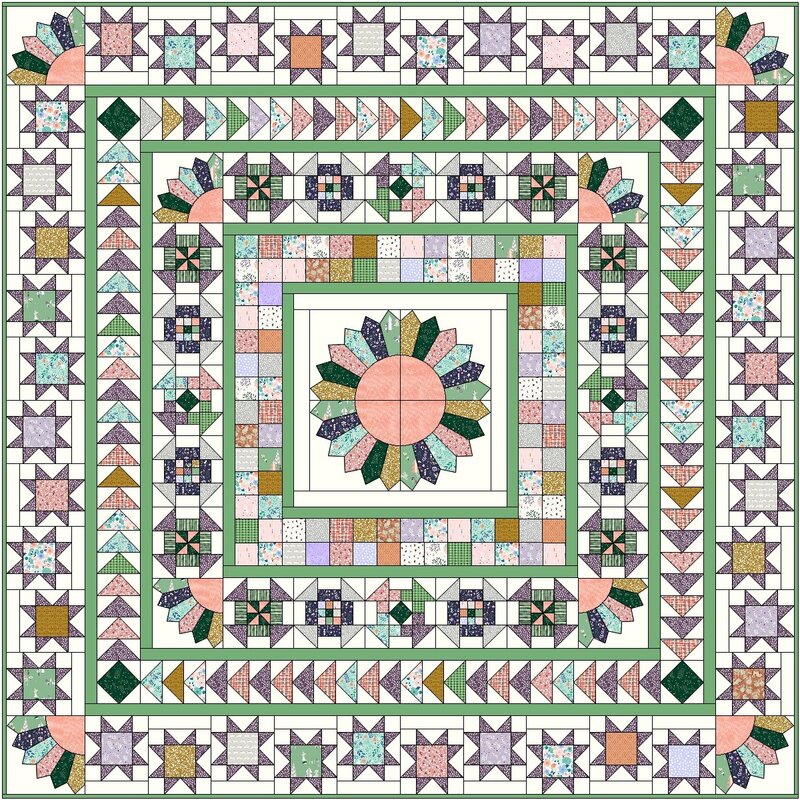 We created double-pointed Dresdens for this quilt, although you could do a traditional center circle as shown in the computer drawing above. 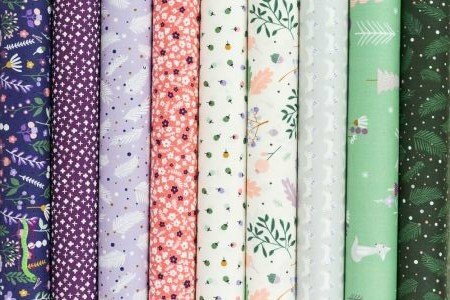 Featuring Andover Cathy Nordstrom Forest Talk Fabrics! 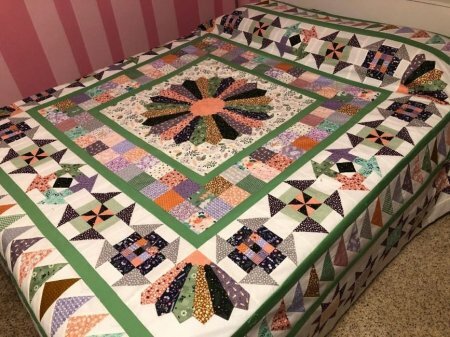 Here are a few of the featured fabrics used in this quilt. Part 1 - Sign-up Online or over the phone. If you order online, please note that your payment details are encrypted and we cannot see your credit card information. Orders will come in as "pending" and we will then process your payment, generally within 24 hours. Your reservation pays for your final kit. Part 2 - Call us a at 785-243-4044. We need to confirm your shipping address, phone, and email address. We'll also need your credit card details for your monthly billing. We used double-pointed dresdens for Forest Talk Medallion. These are created using the large 15 degree ruler shown below and are sewn entirely by machine! The dresden is positioned over the center fabric. If you prefer, you can make traditional one-point dresdens and them put a circle in the center over the dresdens. 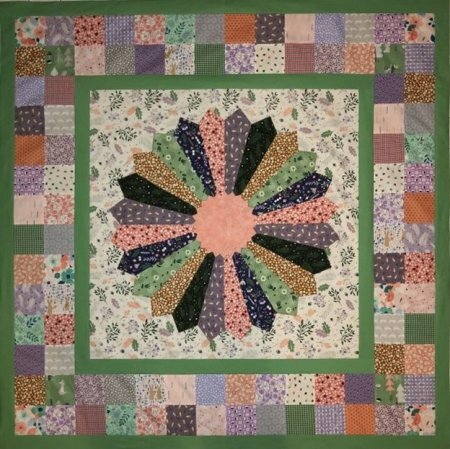 Forest Talk Medallion is a Fabric Essentials exclusive program! Like all our Flexible BOM programs, we will cut complete kits in advance, so you can take as many blocks as you want at one time. Our programs include ample fabric for your project and our famous cutting diagrams so you can SEE how you are supposed to cut the fabric. Coordinating backing is included with this program. We'll need your 1st, 2nd and 3rd choices. 45" backing will be cut into three equal pieces of 3 Yards 6" each (114" per strip), for a total of 9 1/2 yards. The Wing Clipper I, Wing Clipper II, and the large Creative Grids 15 Degree Triangle rulers are used for this project. Here's a Video that shows how the 15 Degree ruler is used.